Sewing continues. I'm starting to sound like a broken record. Everything has been going so smoothly that I should have known something had to go wrong with this project eventually. I've been using my vintage Vikings-Husqvarna sewing machine to sew the cushion covers. I can't say enough how much I love this machine. It's a dream to sew on and beautiful to look at. It sews quietly and smoothly. I could go on and on. So I was happily sewing away last night when my machine became possessed. With no warning it suddenly took off racing at full speed! I thought the foot pedal had gotten stuck at first, but it wasn't. Then when I tried shutting the machine off it kept running at full speed! What the heck?! I finally had to unplug it. Now every time I plug it back in it takes off again. Crazy. My husband thinks it's the wiring in the foot pedal. 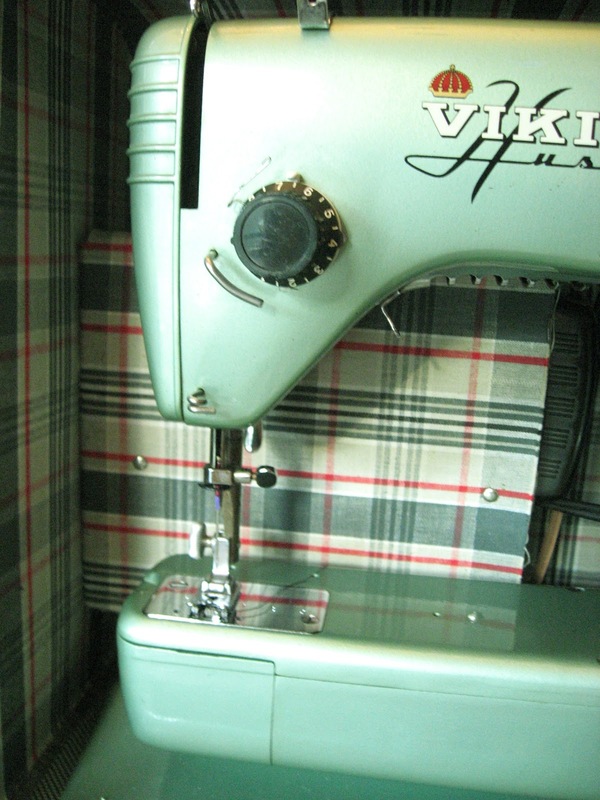 Whatever the case it probably won't be easy to repair or find a replacement pedal for this 1950's sewing machine. Anyone ever had a problem like this? If you have I'd like to hear about it, especially if you have a solution! For quite some time I've been searching for new bedside lamps for the master bedroom. My husband and I both like to read in bed so we needed something that could be adjusted for reading when we wanted, looks nice of course, and is reasonably priced. I signed up with The Foundary a few months ago. They offer limited time sales events to members and have some really great prices. It's free to join and they send a daily email with the lastest offerings. Yesterday the perfect lamps showed up! They're just what I've been looking for and cost far less than similar lamps I've seen. I like the architectural/industrial lines paired with a cloth shade to dress it up a bit and allow for softer lighting. The toggle switch on the base should be convenient for a bedside lamp too. I hope they'll live up to my expectations once I actually have them in hand. Just as a word of caution, most items bought through The Foundary are not returnable. 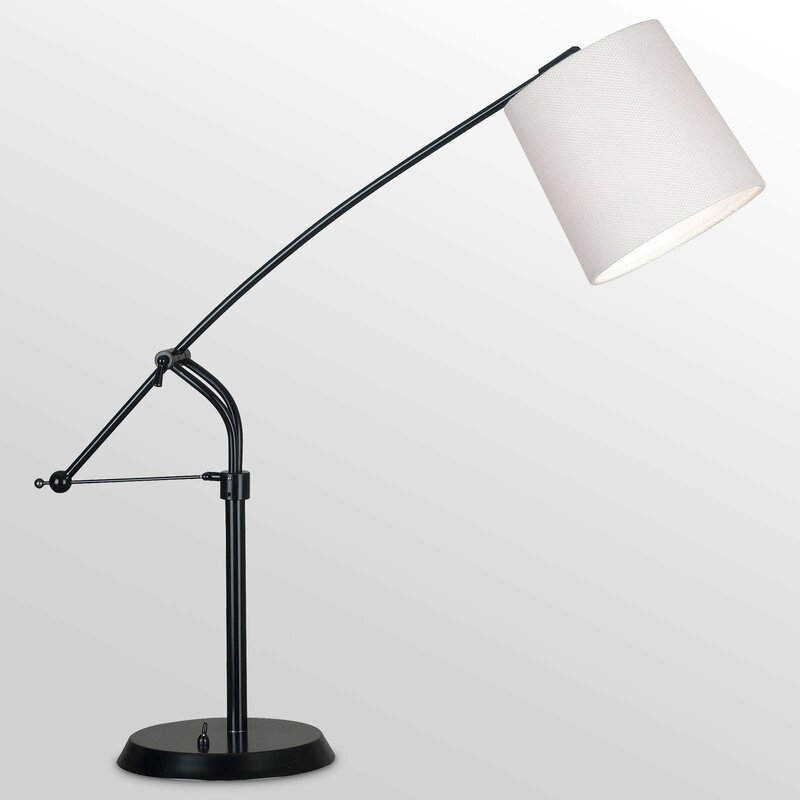 Confucius table lamp in oil-rubbed bronze from The Foundary. That find has led me to decide on my next project. On my to-do list are a pair of Ikea nightstands that need some hacking and tweaking. We also bought a new light fixture for over the bed that I'm really excited about. I'm still on the search for new bedding and rugs. The room needs painting and with that comes plaster repairs. Ugh. Really, really hate that job. Seriously may consider hiring someone to do it. But I'm really looking forward to a redecorated bedroom. It's long overdue. Will you be watching the Oscars on Sunday night? Last year I printed out Oscar bingo cards from How About Orange. It made watching the four-hour long show a lot more interesting, so we'll be doing it again this year. I also like to do a meal based on one of the best picture nominees. I'm thinking a southern inspired dinner would fit in well with The Help and The Tree of Life. Back on Monday. Have a great weekend.